An evolution of an already powerful swing analyser, Zepp Tennis 2 consists of a motion sensor, racket mount and app for your iPhone or iPad that helps you track practice, match statistics and compare against yourself against other players to get instant insights about your performance. With new Smart Capture technology, you can easily record video of each rally then generate and share your match highlight reel. Simply attach the sensor to your racquet and let Zepp help you become the player you aspire to be. Use this free app to enhance your training experience by pairing the app with the square Zepp 1 sensor. 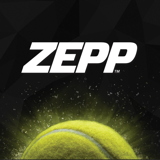 The round Zepp Tennis 2 sensor is supported by the new Zepp Tennis app. Our redesigned free app offers powerful analysis tools for both match and practice play, delivering detailed reports in 3 key categories about your game—power, consistency and intensity.